Downtown Appleton Farmers Market: There’s magic in the market. Wisconsin’s Appletonians look forward to the weekend happenings during their short, Midwestern summers. Lucky for them, Appleton’s downtown is lively, with music, art, and market winding through its core. The Performing Arts Center, five museums, first hydroelectric powered house, and Houdini’s home are all pulls to the city. Houdini may be long past, but there’s magic in the market. Celebrating its 25th season this year, Downtown Appleton’s Farmers Market casts a spell over its locals and binds them together. “The community cannot wait for the market to start. They look forward to seeing favorite vendors, old friends, and all the sights and smells that come with it,” says Djuanna Hugdahl, Event Coordinator for Appleton Downtown Inc. With 150-180 vendors in the summer, and 55 vendors during their winter market in City Center Plaza, we do not doubt that the community feeds off the market’s atmosphere, and that the market feeds the community. Stay tuned for DT Appleton’s two week Instagram takeover– we can’t wait to see what they have up their sleeve! 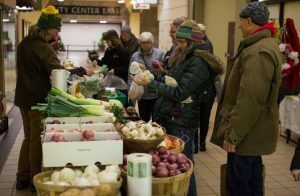 Farmers Market Coalition: Give us a little bit of history on Downtown Appleton Farmers Market. Djuanna Hugdahl: The Downtown Appleton Farmers Market is celebrating 25 years this season. We’re a combination of paid staff and volunteers running the market that spans four blocks, plus a park and can be anywhere from 150-180 vendors, musicians or sponsor booths. DH: The market is outside from June through October, then we move inside City Center Plaza from November through May. Outside we can host up to 180 vendors, inside we’re at 55. We are located in downtown Appleton, closing off the streets, giving market a festival type atmosphere filled with music, entertainment, shopping and more! DH: Due to the proximity of our museums, we are thrilled to be able to offer programming in Houdini Plaza, with fun and creative art and music projects; from music instruments turned into art mosaic pieces to juggling, square dancing or even Irish dancing demonstrations. The market hosts 5-6 musical acts each week, separating them throughout the event, so all do well. Henna art and face painting are available on site. There are WIC and EBT accepted vendors, with information booth swiping of cards and distribution of wooden tokens for vendors to shop. Lastly, our indoor market hosts “Kids Market” on the 3rd Saturday, January through May, inside City Center Plaza. There, we offer the kids a chance to sell their handcrafted items, giving them a free space, with table and chair, to give them a sense of running their own business and being young entrepreneurs. The idea was suggested by another local artist/mom who had seen it in another state, and five years later, we continue to promote this program, as well as offer other fun kid friendly activities on that day. DH: The community; locally, loves their markets and are great supporters as well as telling others and sharing their experiences. We advertise with posters and promote on Facebook heavily; throughout our downtown and surrounding area, and take all of the free opportunities to promote as possible, whether it be on television, radio, speaking at community organizations, etc. FMC: What has made the market such a local fixture since it began 25 years ago? DH: Change and growth. Over the years, the market has evolved from a parking lot space of 30+ vendors to moving onto our newly renovated College Avenue in 2002 with an expansion of 50+ vendors, to now….150+ booths. The community has embraced their market, and made it out to be a destination during the summer months. FMC: How long have you been involved with the market and how did you enter the local food realm? DH: This summer will be my 14th season with market. Our organization is BID funded, and we strive to have a clean, safe, friendly, thriving downtown. Holding events is one of the ways that we do so. So, working in an organization of five employees; we split up the events, and I was lucky enough to work with our farm market. FMC: What are the seasonal favorites? What are your favorites? DH: Seasonally, the varieties of tomatoes, sweet corn arriving from Allen’s of Allenville and the colorful floral bouquets. My seasonal favorites would include: sugar snap peas, Brussel sprouts, ground cherries and watermelon radishes. DH: Making sure we have enough staff and volunteers on any given day is crucial, but more so, at the outdoor event. With the size of market, it is crucial to inspect each booth to be certain proper procedures are being followed, as well as safety measures are taken. Canopies need to be weighted down, cash boxes in a secure location, lost children found, etc. Having the right number of market helpers is crucial to making market run smoothly and efficiently. FMC: How did the market/downtown area adjust to host the 150-180 vendor count? DH: We are one of the largest markets in the area, however…Green Bay, Oshkosh and Madison all have large markets too! We do our best to work with the businesses downtown, listening to their concerns and trying to make it work for all. Traffic patterns have had to change, therefore, signage is key at market. FMC: Do you have any advice to markets that are transitioning to accommodate more vendors or partner with local organizations? DH: Be mindful that bigger isn’t always better. With each expansion of market, we have been mindful of categories and trying not to overpopulate any one. We want all of our vendors to do well, if they do well, they’ll come back year after year and so will their customers. Try to get involved with your local downtown organization. We’re working together for this weekend’s promo, “Vacation Destination” with the downtown businesses and the market has chosen their destination theme as “Down on the Farm”. Be sure to watch for fun photos and more coming soon.